Are you looking to find the best golf cart bag to go along with your golf push cart? Did you know that cart bags are designed to fit perfectly into your golf push cart and not to be carried like stand bags. They are big in size, a lot heavier and have lot of slots and side pockets. They are made to carry all your clubs and anything else that you wish to carry (umbrella, extra apparel and drinks). 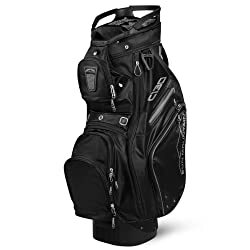 There’s one thing that I definitely want to mention is that you’re surely a serious golfer and you’re very much into the game if you’re looking to find the best golf cart bag. Way to go! However with so many choices to choose from the marketplace it’s not an easy task finding the best golf cart bag to fit your push cart. Our intention is to simplify process for you with our unbiased, detailed and honest golf cart bag reviews out there. Good to have features of the best golf cart bag? The leader in the cart bag industry and known as best golf cart bag of all times. The bag is made of really very high quality which can be seen in its overall build and zippers. Comes with 9 pockets which can be used to store most of your on course accessories. One of the consumers of this product has commented that the bag looked and performed the same after 5 years of use. The 14 full-length dividers ensure that your clubs stay organized and slide in and out easily. Also, the dividers are well padded so you don’t get any unnecessary wear on the shafts. The 14th section is to place the putter which can easily accommodate the biggest putter grips. Finally, the top is laid out in such a way that each club is easily accessible when it’s on the cart. The C130 gets the accessibility right in every aspect, you need to use it to experience what is being said here. The bag is made with an awesome build and quality offered by Callaway, you would be surprised to know that this bag weighs like a feather! With most of the cart bags in the marketplace weighing about 10 lbs, the Callaway Org 14 Cart Bag weighs only 5 lbs which is why its generally compared to a feather. Offers a superior club protection membrane that protects your iron clubs from clanking against each other when stored in the bag which is its key feature. The 14-way top has slotted soft rubber membranes which keep clubs protected from swaying and clanking into each other. Then there’s the heart of the operation…the Silencer Base, which utilizes a compression-fit mechanism at the very bottom of the bag to secure the grip of each individual club and lock it into place. You will actually feel the club lock down when you secure it into the system. And with every club locked into the silencer system you can actually take the bag and flip it upside down without a single club falling out. From a weight point of view, it definitely is heavy and weighs around 10 lbs. You wouldn’t be surprised that when you lift this bag with your bare hands, you might wonder if there is something in it. After all its designed to ride on a cart and not be lifted around. When you look at the M9 III, it is very easy to conclude that this model is stylish and highly innovative. It comes in great color combinations like Blue, White/Grey and Silver/Red. The Nike M9 II Golf cart bag comes with a side grip handle and a 14 full length divider system to hold your clubs and grips. An integrated external putter is also included to give you quick access to your putter while on course. The Nike M9 II Golf cart bag biggest highlight is Storage. If you’re the kind of golfer who carries a lot of accessories during your game, you will definitely need more that 2 or 3 pockets. You may not believe it but the M9 II Golf cart bag comes with 12 pockets! Well, that sounded too much to me when I heard it for the first time. But yes, one thing is sure that it can hold everything that you need during your game. Storage being the biggest plus, golfers looking to carry a lot of accessories during the game should opt for this bag. 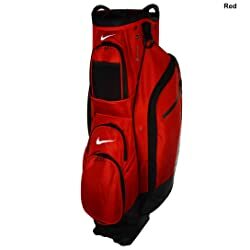 If you’re also looking for a bag that offers superb looks along with awesome design and innovation – the Nike M9 II Golf Cart Bag is one that you must have. 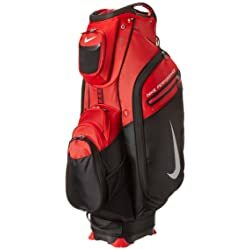 The performance II series from Nike is sleek looking premium golf cart bag with 14 full length individual divider system that makes it easy to access your clubs. 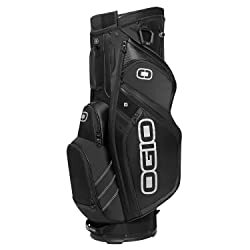 This bag has a lot of room space and the clubs do slide easily in/out of the well-designed top and the “legs” at the bottom make it stand up on its own easily. 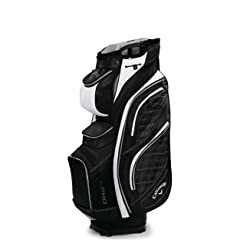 This golf cart bag definitely lives up to its name and you can easily expect a high performing cart bag to support your clubs and other accessories throughout the game. The bag is available in a variety of colors like Black, Blue and Red. In addition to the flip & grip, this bag houses an easily accessible exterior range finder pocket. Other features of the bag include a large insulated cooler pocket for beverages which can easily fit in around 5 cans. In addition it comes with apparel pockets with additional internal pouches to prevent smaller items from dropping from the bottom of the bag. Design – Most of the golf cart bags have a universal design to fit all the golf push carts perfectly available in the market. They bags have sturdy bases that allow the bag to be stored upright and they do not have shoulder straps and cannot be carried on your shoulder or back. On Cart Functionality – You need to see how well the bag would fit on both riding and push carts. Is the functionality of the bag (pockets, glove strips, towel loops, etc.) impeded in any way by cart straps?